Our Spring Story Problem Challenge in Washington state has concluded, and it was a photo finish for Roosevelt Elementary’s team “The Ridge” vs Blue Heron Middle School’s “Herons” hailing from Port Townsend School District. Well done, everyone! We are already starting to prepare a grand challenge in the fall of 2016, and would like to partner with organizations that can publicize and help us run this extensive effort to build on our current successes. 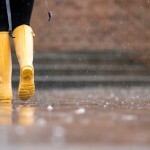 If you can help, please drop us a line at cgs-info@cs.washington.edu and we will put you in touch with our team. If you missed out this spring, or want to get a sneak peek at upcoming development, we have also enabled a new mail list (powered by MailChimp). This will be the first place to learn about upcoming challenges in Washington state and beyond. We also highly recommend our Facebook and Twitter accounts devoted exclusively to challenge news and related mathmatical geekery. 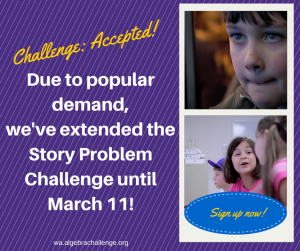 One Week Left for the Story Problem Challenge! Our Story Problem Challenge is hotter than ever this year, with an appearance in the Seattle Times! For those unfamiliar with the process, Algebra Challenges are events run by the Center for Game Science at the University of Washington. During the challenge period, students are encouraged to solve as many equations or story problems as possible by playing innovative games that teach as you go. The play can happen in or out of school; the only requirement is access to a relatively recent computer. Challenges are run at various times of the year in specific regions, and thanks to the interest and enthusiasm of the Spring Challenge, we are looking to run another regional event in October of this year. 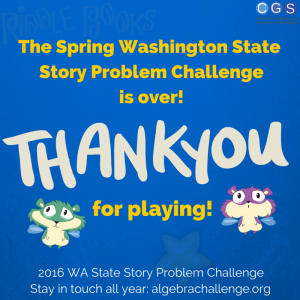 The WA State Story Problem Challenges Are Back! Our Washington State Story Problem Challenges are back. First up for 2016, an exciting one week challenge from February 29 – March 4. Coming this fall, we’re embarking on an expanded challenge (we’re thinking two weeks), featuring not just Riddle Books but (possibly) other fun math programs too! If you want to be in on the ground floor to help us with feedback and ideas, just contact us! In the meantime, we encourage you to visit our revitalized Algebra Challenge website, and specifically our Washington State Challenge site to get the latest news, screenshots, and videos about the challenge. Follow us on Twitter and Facebook for the latest challenge news, and all around fantastic math oriented fun! Please spread the word to every teacher and district you know – together we can achieve it! Our Grad Students Capture Honors! Fresh from UW Today, news regarding the the inaugural Climate Game Jam. This game jam challenged teams at 11 sites across the nation to design a game around the theme of climate adaptation — and to present the idea in a video within 48 hours. Climate Quest, a video game, won first place in the “college” category. It was designed by Dargan Frierson, a UW associate professor of atmospheric sciences, and Zuoming Shi, a computer science and engineering doctoral student who is a member of the UW’s Center for Game Science and currently working as part of our neuroscience game team. Happy new year from the Center for Game Science! We are busy putting together our calendar for this spring – are you on it? We love having field trips to the Center and welcome your group! Additionally, you will want to mark your calendars now for Engineering Discovery Days. This huge 2-day event takes place in April this year and is always a great time for everyone. We look forward to sharing more news soon regarding the results of our fall challenge in Foldit, some exciting Nanocrafter updates, and news from the small team devoted to bringing our neuroscience game to life. It’s an exciting 2016 ahead and we can’t wait to see you all as well!